“Budget” It's is about the closest thing to a curse word as you can get when it comes to business terminology. It’s a word that by definition can be used in a variety of applications, much like its true-swear word cousin that starts with an F. It’s a noun, “we need to stay within IT’s budget”; it’s a verb, “we are budgeting for a rough year in 2014”; and it’s an adjective “our company is so cheap they use budget toilet paper”. Budgets also seem to be the go-to excuse for anything and everyone. Finance departments use it as an excuse to get out of meetings and deadlines: “sorry our budget reporting is due today, so we’ll have to reschedule” or “we can’t take any action until we understand who’s budget this will impact, check back in a couple of weeks”. Department managers use it as an excuse to blow salespeople off: “I like what you offer, but I can’t buy that, it’s not in the budget this year”. And Procurement uses it as a weak argument in an attempt to get better pricing: “I’d like to pull the trigger, but your pricing would push us outside of our budget”. The idea of budgets is sound; provide an itemized summary of estimated and actual expenses for some period of time, so that you can develop a systematic plan for financing and planning around those expenses. And although your finance team often wants you to think so, you don’t have to hold an accounting degree to understand the fundamental basics of a budget. At your home, you budget money for food, shelter, and transportation; and hope that at the end of the day you have some cash left for savings, investing and entertainment. Not to discredit that finance and accounting team though, most people don’t deal a lot with depreciating assets, inventory holding cost taxes and other variables that are learned through years of education or on-the-job training. While the idea of budgeting is sound, far too often the practical business application of them often is not. I've already mentioned how everyone’s favorite excuse is a budget, whether they use the paperwork and meetings associated with preparing budgets as an excuse to get out of other work, or they use it as an excuse to not fund a new initiative that might have longer term benefits, we’ve all heard the term thrown around as an excuse for something. Worse than excuses, most companies do not measure the actual time that their employees spend creating reports, working through spreadsheets, negotiating concessions and sitting in meetings every year; and we are talking about production employees and managers, not just finance departments. I think most companies would be amazed at the payroll costs that they outlay in trying to forecast and report against budgets. But the overhead costs are not the only thing about budgets that are costing you money. 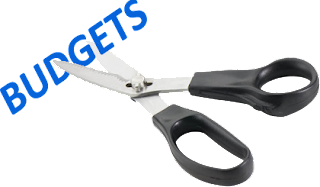 Our procurement services consulting firm recently had two completely different budget scenarios pop-up from two completely different companies (one a client, the other a prospect), which also led me to memory I had of my first exposure to budgeting. These three budgeting ideas then drove me to the blogosphere in frustration to write these posts. In all three cases that I will outline for you, I’ll show how traditional budget processes and budget measurement metrics adopted in these organizations are flat out costing them real hard-dollar money. Read the first case study on why budgets are costing you money.